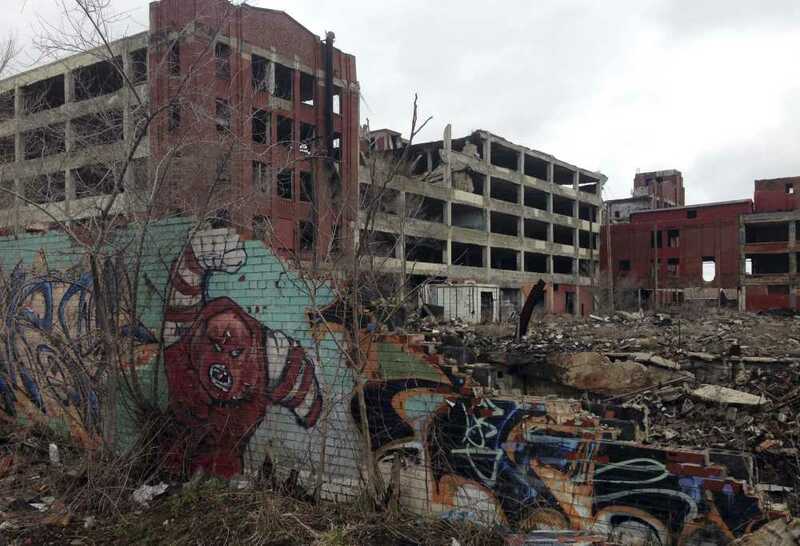 The vacant Packard car plant on the city's east side is shown April 4. DETROIT -- Peruvian developer Fernando Palazuelo saw the hulking and crumbling Packard car plant on Detroit's east side and vowed to turn the industrial ruin that's a symbol of the city's urban decay into bright apartments, busy shops and art galleries. It's been more than three years since Palazuelo bought the complex for $405,000 at a tax-foreclosure auction, and signs of his promised development have yet to rise from the rubble. His company recently scheduled a May 16 groundbreaking for redevelopment at what was once the Packard's administration building, after telling city officials work would start last August. Spiffing the Packard for redevelopment won't be easy. It's been about 20 years since any companies operated out of the 3.5 million-square-foot site. Before Palazuelo bought the property, city officials said razing the structures and cleaning polluted soil from decades of industrial and heavy manufacturing operations could cost as much as $20 million. "There is probably arsenic and other nasty stuff. No telling what's on that site," said David Whitaker, head of the Detroit City Council's Research & Analysis Division. Palazuelo plans to clean up and renovate buildings at the plant over the next seven years, Kari M. Smith, a spokeswoman for his Arte Express Detroit said in an email. Palazuelo's company in Lima, Peru will cover costs of the project, which he estimated at $350 million when he took ownership in late 2013. Palazuelo eventually plans to live at the plant, Smith said. "We are proceeding step by step in a phased development. Mr. Palazuelo has no plans to walk away from this project," Smith said in response to questions about what would happen if Palazuelo can't come up with the costs. For now, security guards are seen patrolling the site. Parts of the complex have been cleared, and some openings have been boarded up. The company has presented initial development plans to the city. The groundbreaking announcement follows Palazuelo's interest in an eight-story former paper company building in Toledo, Ohio, that likely would require far less work and cash to remake into 80 apartments. Smith said work on the Toledo building and renovations at the Packard plant will be done simultaneously. At the Packard plant, tests have found arsenic and selenium in the soil nearby. Mounds of car tires, clothing and other refuse illegally dumped in the structures appear to have been trucked away. Some, such as the burned shell of a fishing boat, still sit inside the buildings. In October 2014, crews ripped out some of the exterior wall and upper floor supports in the main building. That's the last time Derek Webb -- whose grandmother has lived a block away from the plant since the 1950s -- remembers seeing any demolition work at the plant. Fixing up the Packard may be too much for anyone, even a rich guy, said Webb, 54. "I thought it should have been torn down," Webb said. "If I was a millionaire, I'm not putting my money in this. I'd tear it down and make it flat land." The Packard Automotive Co. built the plant in 1903, but by 1954, the structure had become obsolete, and Packard car production was being done elsewhere. The company would go out of business a few years later. Detroit took over the complex in 1994 when an investor failed to pay taxes. Another company later took ownership but also would lose the property due to unpaid taxes. Taxes are up to date under Palazuelo, according to Wayne County Treasury Eric Sabree. "We wish the owner great success in fulfilling his development plans and returning the property to a higher use once again," Sabree said.